Yukkuri Free Time Literature Service: Nihonkoku Shoukan. Volume 1. Prologue Part 8. The last part of the prologue. In case you wondering… All the prologue is a complete rewrite of Chapter 1 WN. Yeah. You read it correctly. We even haven’t reach Chapter 2 WN. Tanaka was praising without minding the surrounding listener. Yagou didn’t feel bad being praised like this. Since his side was the one received surprise until now, to cause the Japanese side surprised for the first time made his heart wanted to boast about it a bit. At Tanaka’s simple answer, the delegation members were shouting out from astonishment. The concept of science that Qua-Toyne didn’t have. It was the moment where the members of the delegation got their hand on a state-secret level of information. If magic didn’t exist in Japan, then the magic technology that is studied in Qua-Toyne Principality could be presented as a negotiation issue. Healing magic’s forte is in temporarily recovering wound. For example, if they proposed simple surgery magic, then it might be possible to establish a clinic that could immediately cure small wounds or stiff shoulder and there should be a demand for emergency use like the one in the accident not long ago. If there are unsolved diseases in Japan, then they could also propose to research it together. If they open a magic academy and provide the teacher, they could increase employment and even obtain foreign currency. On the other hand, there also could offer a term to import Japan’s education system into Qua-Toyne Principality. If the children could obtain knowledgeability using Japanese way of learning, then it would be heaven-sent. It was a significant discovery that Japan relied only on the knowledge of science. In this world, to be able to gather a large number of magicians would be advantageous in a war and so magicians had a strategic importance. However, there was the question of the development and personnel of the magitech research, also the difference in the individual qualities, which presented a major challenge in establishing a large division of magician that is uniformly powerful in the first place. Compared to that, as long as someone knew the basic of the science, then anyone could easily become a powerful soldier. In other words, it was possible for even Qua-Toyne Principality’s citizen to do so. Tanaka already had expected that question. From the Japanese point of view, there were many mysterious things in this world. Especially the origin of the language-related “even when speech is understandable, the written letters becomes different language and grammar” phenomena. Japan had begun a study to translate the materials that had been brought back from Qua-Toyne Principality from the first meeting, but Japan’s information about this world was still too scarce and the materials amount was too few that it was an extremely difficult ordeal. Yagou interpreted Tanaka word that it was sold in bookstores as 「We won’t mind to give out if it’s just fundamental knowledge」, so he decided to bring back chemistry or physics books as much as possible for the time being. While the 5 people board it with uneasiness in their heart, today too was yet another safe travel for the Shinkansen. After passing several large cities, the Shinkansen we boarded arrived at Japan’s capital city, Tokyo. The provincial cities that we passed midway are even more developed and greatly surpass the capital of the major countries that crowds the Civilized Lands, but Tokyo is on a different dimension. Just about anything moves punctually, the number of the population is huge, and the height of the highrise buildings are as if to pierce the heaven. There even a structure that surpassed the famous Eijei Mountain (539 meters above sea level) of my country. For myself, as a member of the diplomatic mission that is dispatched to a country that could build these huge buildings, I am looking forward to the working-level meeting tomorrow. For my country’s national interest, I will work to the best of my abilities. It’s a heavy responsibility, but it’s fortunate to be present in a history-making moment like this. Central Calendar Year 1639, Month 2, Day 8. One slender bespectacled man began to address the diplomatic mission delegation from Qua-Toyne Principality. Though the Japanese had prepared documents that described various necessary food items, they already received the report that written materials won’t be understandable for the other party, so Himura was reading the document and described each of the items orally, which contents made the delegation members looked at each other. Yagou wrote the amount of item that Himura had cited with his own country’s script in the document on his hand. While looking at it and furrowing his brow, he began to speak. The Japanese foreign affairs officials were in astir. Honestly speaking, the request included items that need to be imported from several countries, but for a single country be able to provide them all…… It wasn’t strange that they were surprised. By some chance, a possibility to avoid a food crisis in Japan had come to their sight. The Japanese delegation sat back and a white-haired bespectacled dandy man began to talk. This time it was the turn for the Qua-Toyne Delegation to be astir. For Qua-Toyne Principality where water and food were almost close to free, the country could be enriched just by exporting it and, in addition, they even would receive harbor and railway. Is there any more favorable term than this? They also negotiated for several other items, and while discussing the future preparation for both party sealing the deal, the conference finished favorably. Central Calendar Year 1639, Month 2, Day 18. 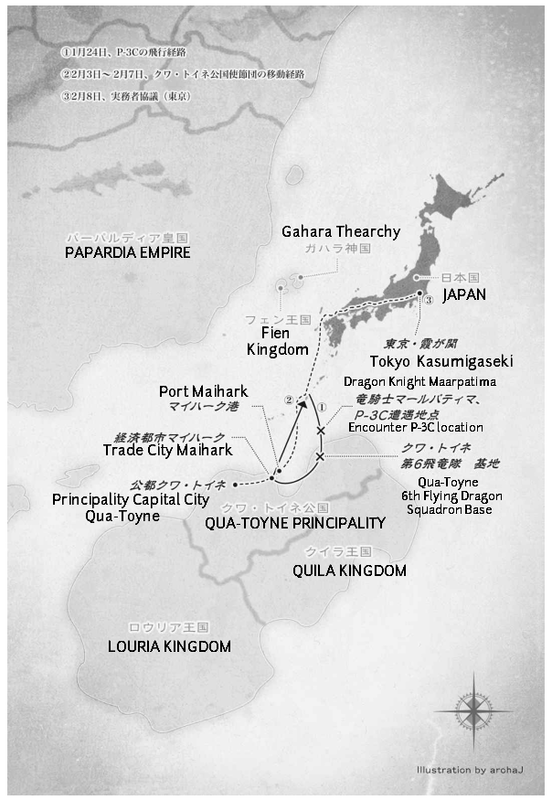 Qua-Toyne Principality and Japan had agreed on these points. · Qua-Toyne Principality will export the food needed by Japan. · Japan will expand Port Maihark in Qua-Toyne Principality and establish transportation infrastructure from Maihark to the farmland regions using Japan’s capital. · Japan and Qua-Toyne Principality will continue to discuss with each other toward establishing a diplomatic relationship. · An exchange rate will immediately put in place. · As the compensation for Japan’s bulk-purchase of food from Qua-Toyne Principality, for a period of one year, Japan will establish essential infrastructure (water service, electricity, gas service) within Qua-Toyne Principality. · Japan will continue for a conference with Qua-Toyne Principality to discuss the signing of a non-aggression treaty. 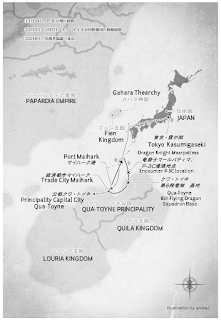 Japan and Qua-Toyne Principality were able to establish a favorable relationship. This inseparable friendly relationship that they will create in the future became a ship where both nations shared a common fate. A ship that challenge the violent torrent of this world. Why it’s a bad idea to bully Qua-Toyne-chan? Because Nipon-oneesama will get angry. Tokyo Skytree is 634 meter high. Metric ton. 1000 kg. You know I don’t count things in Imperial right? An actually reliable ally from a world that's not Earth? Obviously Japan wont hold notions of human supremacy and destruction of the beastman races. Viva la nekomimi. Safe the pretty animal eared onee-chans! We must not let those soft ears disappear from the world! Crush those that wants to exterminate them! Join us in the Beastmen Volunteer Defense Corp! They may want to protect the beastman races, but Japan would also fetishize them more than almost any other country from Earth. They might end up creeped out by the attention. Unless they can fulfill their own resource needs without relying on anyone else, and they could do so in a manner that's impervious to magic attacks on any part of the system, they would eventually have problems. And the population should already be somewhat ... astir with the whole transfer (unless they've managed to cover it up which would be amaszing), so another problem would only make it even worse. Reincarnation Flower too... though I'm not sure if that one counts. Many people assembled today yelling about saving the cat eared onee-chans, and various other animal eared people. Japanese youth in military uniform: For the freedom of the Beastmen!! !